Omelets are one of the most versatile dishes out there as you can serve them with just about any savory filling and make a satisfying breakfast, lunch, or dinner. As they’re made with eggs, they’re incredibly budget friendly, they don’t take much skill to make, and your choice of filling can take you to the Americas, Europe, or Asia! For this omelette, I opted to go Southwest American, filling it with my favorite store-bought salsa, aged cheddar cheese, and some cooked bacon. The sour cream added to the eggs creates bulk and makes this omelette nice and rich, making it perfect to serve with potatoes and a nice salad. Get your grated cheese, green onion, salsa, and bacon ready and set aside. In your trusty mixing bowl, beat the eggs and sour cream together until you can’t tell them apart and they’re evenly combined. In a pan on medium heat, heat the oil and swish it around to evenly coat the bottom of the pan. Dump in the egg mixture and swirl the pan around a bit so the bottom is evenly coated. When the omelet seems slightly cooked around the edges, dip the edge of your spatula in it, pulling it from the outer edges of the pan to the middle, allowing the wet egg mixture to fill in any gaps. You may need to tilt the pan a bit to allow for this. Repeat the process until the eggs look mostly cooked but are still slightly wet in the middle. Spoon the salsa over the eggs and add the bacon (if using), the grated cheddar, and most of the green onion. If you’re serving to a crowd, you’ll want some green onion left to top it with and make it pretty. 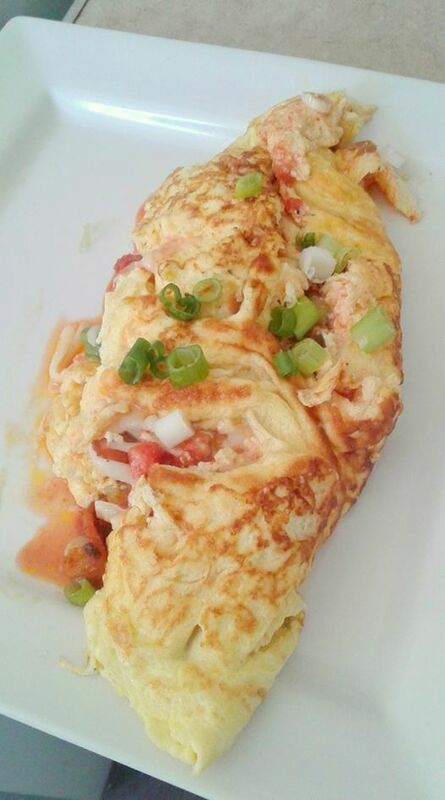 Using your trusty spatula, fold the omelet in half or roll it into a cylinder – it doesn’t have to be perfect. The heat of the omelet folded in on itself will cook it the rest of the way. Turn off the heat and slide the omelet onto a plate.